Always count on a lolcat to cheer you up. Anyway, the comments from the second Alpha are in, and he liked it. Yay! Now it’s time to revisise and type it all up. In fact I started reading the raw draft the other day and I could not stop reading. Go figure. Am I good or what? Oh never mind. Well, at least the story is good enough that I don’t feel like flinging it to the nearest trashcan, so that’s a plus. So, now I have to schedule my time around working on book 2, restarting book 3 and querying book 1. I used this song to set up the mood in the first chapter of the book. Too bad it will have to remove it, because I don’t have the money to pay for the rights to it and I doubt a publisher would take a risk in paying for said rights in a book by an unknown author. Still, it fits so here it is: Living on the Edge-Aerosmith. Mistborn, by Brandon Sanderson, whose writing credits include Elantris, is the first book in the eponymous epic fantasy/dark fantasy trilogy. After reading it a single term comes to mind: Mirror Image. Specifically a mirror image to his first novel, Elantris. Both are set in cities full of despair ruled by barbarous leaders who care little or nothing for those who they lord over, the streets are covered in grime (whether liken or ash) and all around you the broken remnants of once proud humanity huddle in the corners waiting to die. But while Elantris focuses on the people on top (noblemen and priests) Mistborn is told from the point of view of slaves, thieves and street urchins. Both feature a well thought out magical system which is woven into the the plot line, so much so that Sanderson has become the master at turning his extensive world building into an key elements in his plots. Figuring how Allomancy (the use of certain allows and metals which are consumed in order to deploy certain magical powers) works is as crucial to Mistborn as figuring out how the Elantrians lost their power in Elantris. 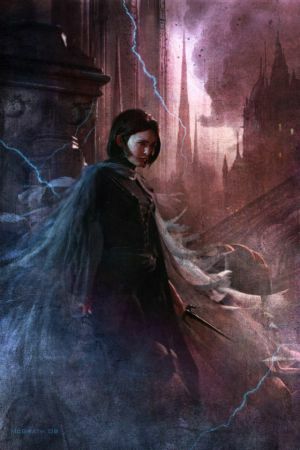 Just like his first book, Mistborn is choke full of interesting characters, especially strong female leads (in an interesting reversal, the main female character in Elantris doesn’t have any powers while her male counterpart does, in Mistborn it is the female lead, by the name of Vin who has powers that surpass all others). It also starts a bit slow only to pick up speed half way through the storyline and rush to the end (with a bit of deux machina thrown in at the last second) and the villain(s) doesn’t get as much development as they do in Elantris. Religion is also a noticeable element in the story, but not as crucial as it is in the first book. Following the mirror image metaphor, Mistborn feels like a stand alone book (even though it is the first of a trilogy) while the ending of Elantris (which according to Word of God is a stand alone tome) feels like the precursor to a much larger story. That doesn’t make Mistborn a bad book, on the contrary, the twists are interesting, the characters are compelling and if you liked Elantris, then Mistborn is a must. Well of Ascension and Hero of Ages are on my to buy/read list. It happens to all of us (writers that is), our minds overload with ideas, jamming our train of thought and skewing our writing course. Which means, that sometimes you just have to stop, download your brain and keep going. Yes, download, as in downloading files from/to a computer or server. Happened to me last week. I was gong through a bit of writer’s block. No, this time around I wasn’t bullying my characters into doing something they didn’t want to do. Instead a set of ideas bubbled up from the ether and into conscious foreground. A figure stood at the mouth of a dark alley, fedora shielding him from the pouring rain and at my feet laid a dead body. Everything was in black and white except for the bright red stain of blood in the corpse’s chest. How can you say no to a guy with a smoking automatic on one hand? I sure wasn’t going to try. How exactly did I do that? Did I invent a neural interface so that my thoughts would be converted to Ones and Zeroes and travel from my squishy brain to the desktop’s hard drive. Pen and paper. Lists, time-lines, notes. That’s what I’m talking about. Now, I am not to just start writing the moment an idea seizes me. I don’t keep a notebook under my pillow. I let my thoughts marinate in the deep fryer of my mind for awhile. Sometimes they disintegrate in the slop or retreat back to the ether, but this character just wouldn’t go away. Setting: Grant City, U.S.A. Midwestern City, Alternate Earth, 1920s-1930s.The Great War lasted until 1920 and ended with the occupation of Germany, Austria-Hungary and Anatolia (modern day Turkey). Revolution spreads throughout the world. European Empires bankrupt. Prohibition becomes the law of the land, gangland violence and racial tensions are on the rise. Main Character: John Malone-Psychic Detective. Psychic powers are all variations of empathy. Also suffers from an extreme form of colorblindness. Genres: Diesel Punk, Short Story, Alternate History, Science-Fiction, Comic Books (Watchmen and Sin City). And so on. By writing it down I can clear my mind and refocus on my current WIP. I can also tell if it’s just a straight shot in the dark or something I can work with at some later time. Think of it as a bit of mental (not as in crazy mind you, although…) Spring Cleaning. Rubbish out, clean air and useful thought patterns in. Final reminder that the “Behind the Headlines” Blogfest kicks off tomorrow, April 5. Can’t wait to read what you wrote. This is my entry for the February’s Fight Scene BlogFest. The afternoon sun beat down on Hadrian’s exposed skin. The harsh light glinted of the naked steel of his sword. The roar of the crowd washed over him. He was their favorite, their champion. He ignored it all by counting the clanks as the portcullis rose before him. Each metallic bank of the hidden wheels counting down to the engagement. Each one bringing him closer to the fight. “If you want her, you will have to buy her,” said the jealous lover. “Five hundred talents at least, my boy. Enough to make your dreams come true,” exclaimed his manager. “Yes, I will leave with you, where ever you want to go my love. Beyond the mountains where the summer’s are cool and the winter’s quite,” said the woman he loved. “Not this time. This time you will meet your match. My beast will feast on your bones,” exclaimed the exultant rival. “Make it a fight for the ages, and your debt to me will be repaid in full,” said the petulant Duke. All the reasons why he was here. One way or another this would be his last fight. Hadrian walked into the arena. He felt the sand between the toes of his sandals. The Duke sat high above him across the oval, surrounded by guards and war wizards. His girth a product of his opulence. He kept the bread and gave his people circuses instead. And for the last ten years, Hadrian was the main attraction. A hush descended upon the crowd. Once slaves battled beasts but gladiators fought other men. The Church tried to outlaw the games but they only managed to “reform” them. Gladiators rarely fought to the death and fighting animals was rare. Fighting such a dangerous beast could very well mean Hadrian’s death, and they did not want to see that. Not their beloved champion. But Hadrian bowed once again to the Duke and when he raised his head he gave the crowd a wide smile a smile that hid the fear that consumed his thoughts. Faint cries of “No” turned to screams of adulation. A panel slid open on the arena floor. A gigantic worm slithered from within the bowels of the arena with lighting speed. It’s beaked head raised to the heavens. It gave a ear splitting screech. Hadrian stared his at the dun colored, slime covered opponent. “Not the brightest idea you ever had,” he said at loud. The beast turned down toward Hadrian. It’s beak like maw split open, spitting twin streams of viscous liquid that met in mid air. The gladiator raised his shield in time to block the attack, but saw in horror as the sun came though the wholes left by the corrosive spittle. He dropped the disintegrating shield just in time to see the wyrm descend upon him. He rolled to his left. The razor beak snapped in the air, spraying sand everywhere. Hadrian stood with a kick stand, just to be battered by the powerful stroke of the wyrm head. The strike sent him flying against the masonry wall of the arena. Hadrian shook his head, trying to clear his clouded vision before the wyrm’s beak snapped him in two. He danced around the wyrm, using his size to stay under the wyrm body. But his attacks had little effect. The combination of the slime and the beast thick hide turned body piercing stabs into glancing blows. He drew thick, putrid smelling blood where the sand clung to the underside, neutralizing the ooze. Yet each strike only made the lyndwyrm angrier. Hadrian ducked and weaved careful not to slip in the trail of slime left by the wyrm. He ran until he reach the wall beneath the Duke’s seat. The wyrm charged him. At the last second Hadrian moved out of the way. The stadium shook with the impact. The beast reared it’s head, then spit anew. A pair of war wizards gesticulated wildly over a burning brazier. Columns of fire intercepted the acid raining down on the crowd. A guard stepped forward, crossbow in hand. The Duke glanced at him. The guard stepped back but kept the crossbow at the ready. Hadrian traced the slime path way back to the wooden door from which the wyrm entered the arena. Once he felt wood underneath his feet, he angled his sword to catch the sunlight. The reflection shone on the wyrm’s black eyes. Enraged it dove down on Hadria. He rolled to his right. The worm struck the door, destroying it in a shower of splinters. It thrashed in sheer desperation. Hadrian crouched nearby waiting his chance. As the beast liberated it’s head, Hadrian slashed at the exposed eye. The dark eyeball exploded on contact with Hadrian blade. The beak missed Hadrian’s head by mere inches. Hadrian moved back and forth, taunting the creature by darting away at the edge of its damaged vision. It came down, again and again until Hadrian saw his opening. On the last attack, he rolled on his back and the jumped, holding his sword in an overhead two handed strike. This time the blade sunk deep into the wyrm’s head. The creature tried to pry his tormentor by shaking its head from side to side. Hadrian held on as much as he could. Then he slid down on the wyrm’s back. He landed with a thud on the ground, covered in blood, sand and slime. He turned in time to see the lyndwyrm collapse in a heap a feet away. Every bone in his body ached, but he had won. He would miss the adulation and the excitement, but not the fear. And for the first time in ten long years, unchained and unafraid. Well that’s my entry. I hope you like it. I came across the Fight Scene BlogFest on Random Writings (hi Carol!) which lead me to Crimso Ink post. The goal is to write and post a fight scene of reasonable length as part of the BlogFest. Since I written about fight scenes before, I thought I give it a try. 1) In the next 2 weeks, write a blog post about the Fight Scene Blogfest to spread the word! Why? Because it wouldn’t be very fun if no one knew about it. Duh. 2) Post a link to your blog in the McLinky at the bottom of this post so we can all jump to your blog and devour your Fight Scene! 4) Not a story writer? Find your favorite movie/tv/book fight scene. The one that had you on the edge of your seat and wincing when a blow landed. You should go to the original post (link above the rules) to enter your blog into the McLinky widget. The BlogFest kicks off on February 1st. And now another AMV from my favorite anime- Samurai Champloo, which happens to have great samurai fight scenes too! In the spirit of full, honest and complete disclosure, I am a liberal. Why did I just write that? Because it informs my worldview and by extension my writing. So does my religion or lack thereof (I am an agnostic). Anyone that thinks that you can write anything without a trace of bias is deluding themselves. And Speculative Fiction is riddle with great stories written by authors that showcase their religious, philosophical and political views. These are but a few of the authors who have used speculative fiction to explore and engage their readers along political, religious or philosophical lines. There is something about creating your own world universe that allows the author too expand on his views, mainly because said world works under the rules he created for it, thus it is malleable to his worldview. When done well the author engages in a thoughtful conversation with his audience, one that allows the audience to question the material and engage in their own quest for understanding. When done poorly, the reader feels like the author dropped an anvil on his head while screaming “I’m right! I’m right! I am always motherfucking right, you ignorant turd!” in his face. Be upfront about your positions: You don’t need to repeat them every chance you get, but being upfront about them means that you are not disrespecting your audience with some stealth morality lesson or political view. Somebody, somewhere will disagree: Specially on the interwebs. It’s the nature of the beast. Know how to separate the genuine concerns/critiques from those that use your work as a straw man for their views. Do the research: If you don’t want to sound like a doofus talking about the evils of Capitalism/Communism/Evangelism etc, do the research, specially if your mocking/criticism those views. Don’t let your bias get in the way of the story: Story first, second and always. Let the story reflect it’s own values. Write the story, and let the readers figure it out. Whether you want it or not, and whether you admit it or not, your writing is a reflection of who you are and that means that your views will seep in. It’s the nature of the beast. The Writer Faces His Muse. A little over a year ago I started on my second book which began as my first NaNo. The book in question was born out of a need to explore multiple philosophical, religious and artistic ideas though the medium of a anime/manga inspired novel. The unnamed hero would wonder the Earth, confronting all manner of abominations and in the process explore the concept(s) that served as the title of each chapter. As it often happens, the end result (as of the first draft) had very little to do with the original concept. Once the main character came into being, there would be no aimless wondering. Ethan Allen would not have any of that. He would travel, seeking out to slay the demons from within and without. He embarked on the Hero’s Journey. Now I had heard about Joseph Campbell before. Anyone who has taken a peak behind the curtain of a certain piece of celluloid would have heard the name. But until this summer I had only heard of him though the words of others. Then I read his book (which I just finished, I’ve been on a slow reading track as of late). 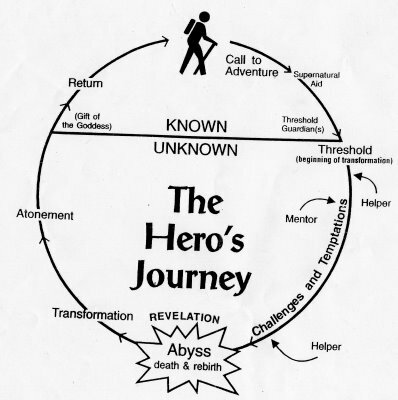 The book is more than a delineation of the Monomyth/Hero’s Journey but an exploration of the mythical/spiritual side of human nature as expressed in myth and legend. Not only that, but he makes a Freudian/Jungian diagnosis of a collective psychosis that grips modern man (mid-20th century man around the time he wrote The Hero with a Thousand Faces) which has abandoned the Myth-Space (my term) consciously, yet the need for it survives in our unconscious minds. So what does my novel have to do with Campbell’s work? Well, consciously (or otherwise) I mirrored Campbell’s ideas about this myth-space or as I called it, The Beyond, in the book, which is the source of all things supernatural and the stories hero, Ethan Allen journey also mirrors the journey from Departure through Initiation and Return. The story also embraces the basic principle behind comparative mythology, that all myths reflect basic needs of man and therefore are reflections of each other. Ethan, who is a Japanese-America binds within himself two mythic traditions and encounters many others in his journey. Of course, I reject the Cristian-Precursor view of men like C.S. Lewis (one in a long line of Christian Apologist who claimed that the mythology of other cultures was a poor imitation of Judeo-Christian mythos) or the someone antiquated language use by Campbell himself (language that while considered appropriate for his time, would not be acceptable under the rubric of current euphemism), especially when he speaks of non-Western cultures. Yet, I would be remiss if I did not point out the obvious, that the spirit of Campbell served as a muse for Strum und Drang, just as my own biography served as a muse for my first novel. So I must acknowledge his presence and his impact in my own work, and I hope I can do his work justice. After all writing a novel is like embarking through the hero’s journey: One hears the call to write, traverses the difficult terrain of story creation and then returns to where it all began.